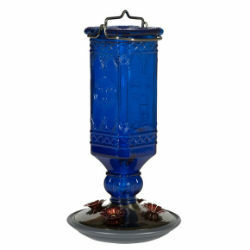 This decorative feeder features a vibrant blue antique bottle and a brushed silver base. The hardened glass nectar reservoir has a unique square shape and holds 16 oz. of nectar. Hummingbirds will flock to feed from this feeder’s four decorative flower feeding ports. The base easily comes apart and reassembles for easy cleaning. This feeder is sure to be a timeless addition to your backyard!